Mission Moments: Our Last Week in Sibu! Our Last Week in Sibu! The week started with a surprise, but not really a surprise. We had been keeping our mouths closed to the fact that we are leaving next Sunday morning and would not be attending church in Sibu. We thought we might be able to get out of speaking in Sacrament meeting, but, alas. that didn't happen. Why there were no speakers assigned to speak in Branch One we have no idea. Fortunately, President Lai and Brother Tandiman were there. They were the first two speakers, followed by Sister Bodell. There was an intermediate hymn, and I was the concluding speaker. It was not a complete surprise that we got to speak. It turns out that the meeting was very nice, very spiritual. Both Sherrie and I were able to convey our thoughts in English and Malay. I believe we were both blessed with the Holy Ghost. We both had ample time to share our feelings. We also had the opportunity to speak in Branch Two. There were two other speakers who were both quite lengthy, but we still had a little time to share our testimonies. We attended our last Branch Two choir practice today, too. Sherrie accompanied because the Elder who usually does wasn't there. I had the opportunity to direct a couple of hymns, including God be With You. We sang the hymn in Indo then sang the first in English. It was very touching for all of us. I told these wonderful people that those words were our prayer for them. God be with (all of) us till we meet again. Sunday evening we had a nice dinner with President Lai, Brother Tandiman, and President and Sister Chua. It was quite relaxing. After dinner, we took Brother Tandiman to the airport and said our goodbyes to him. We won't see him again. Monday we mailed a second package home. 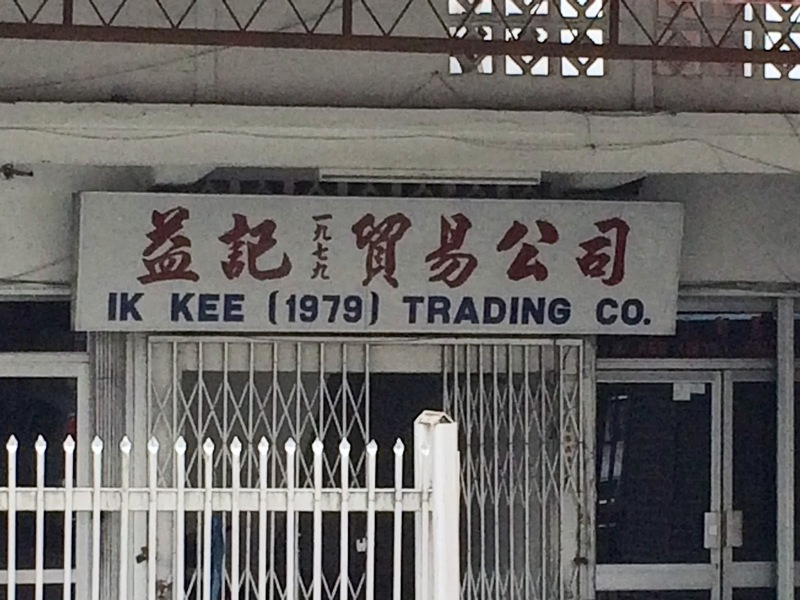 We mailed the first when we were in Kuching. This one cost a little more to mail. It was pretty heavy. We also got our usual runs to GDex and the bank. This was our last run. Traffic is usually bad, but today it was the worst we've seen it. That might be due to it being the last day of the Chinese New Year celebration. Monday night we were back in the middle of a war zone. It started about 6:00 PM and continued for most of the night. It's like the neighbors were in competition to see who could make the most noise. The good news is that this ended tonight. Tuesday was our last district meeting. Afterwards we went to The Noodle House with the district. I had the sizzling pork chop which is unusual because they usually "don't have" or "out of stock." It was really good, but I'm not sure it was cooked properly. That afternoon and evening I had to stay close to home. I won't go into details. A side note to this adventure is a little establishment across the street from The Noodle House. The name is how I felt! Tuesday evening we attended our last Chinese FHE. It was a special edition in our honor. The food was good, and Sister Bodell and I said our goodbyes to the wonderful members of the Chinese Branch. On Wednesday afternoon the Elders were going to come over and wash our cars. It was raining pretty hard so we texted a set of missionaries to tell them another day would probably be better and to pass the message on to the others. Sometimes there is a lack of communication as was the case today. One set didn't get the message so we put them to work cleaning one of the bathrooms. Elder D and Elder LW - Thanks guys! Sister Bodell spent most of Thursday morning printing the words to many of the Primary songs on posters so the three branch Primaries will all have copies. This was after we got up and washed both of the cars in our driveway and sending a car report to the mission office. No more car reports after Saturday! Thursday evening we went to Sister Ruran and her family by ourselves. We've been putting it off, trying to get the Elders to set up an appointment because our English isn't that good. The Elders called and asked if we'd like to go out that evening. We were busy at the time, showing Dimi and Natalie where some of the better places to shop are. We decided that we would bite the bullet and go by ourselves later that evening. Turns out we had a delightful time without the missionaries. Sister Ruran called Sister Bintang who came over with her kids, Loren and Jacky. Between our pidgin Malay and their pidgin English we got along just fine! We're kicking ourselves for not being more courageous and not doing this sooner. If you check back through the archives of my blog, you'll find the picture of their baptism day. I am standing in the picture dressed in white because I had the privilege of baptizing the whole family. They are so beautiful, but have been less active due to transport problems. We love them, and they seem to love us, too. It was beautiful to watch Sister Ruran light up when she saw Sister Bodell! She practically ran to her and gave her a hug! We will definitely miss them. Thank goodness for FaceBook. Turns out that Thursday and Friday I was still having issues with a digestive issue. 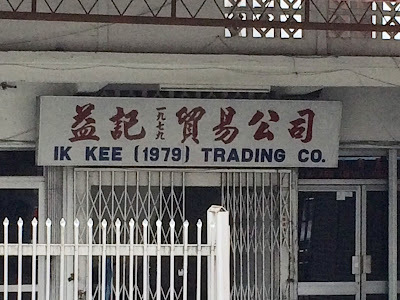 I felt like that trading company in the second picture in this blog. 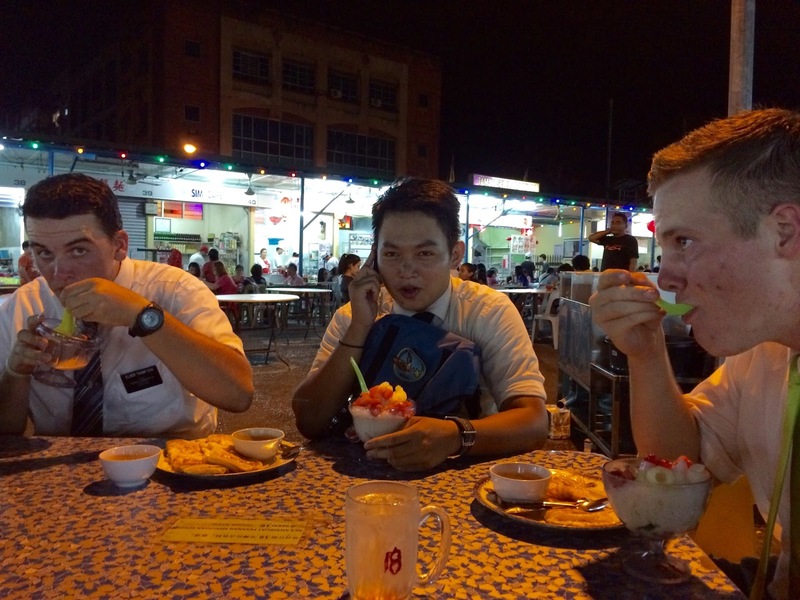 However, I decided that I still wanted to go to the Fruit Bowl one more time with the Elders before we come home. After the English class on Friday evening we met at the Fruit Bowl for our last time. The Fruit Bowl has become a Saturday tradition. 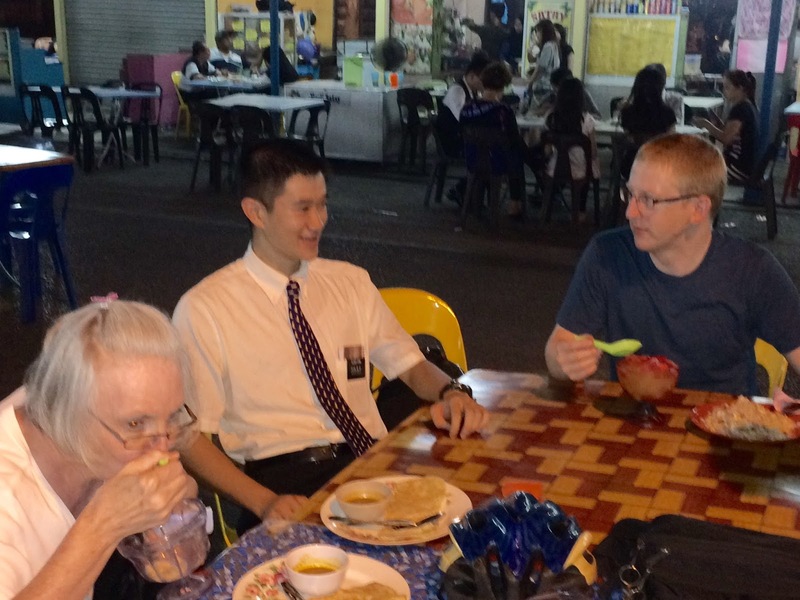 The missionaries meet there about 8:00 PM for dinner and talk about their week. They call it Sibu Sabtu, which means Sibu Saturday. We went on Friday night because there was party at the church for us on Saturday night. I have to share a picture here before I forget. Can you guess what the national sport is here? No, it's not tennis. The racket is smaller than a tennis racket and larger than a ping pong paddle. Ping pong is really big here, too. Saturday we finished our packing, cleaning the house, baking cookies for the Elders, using up what food stuff we had on hand. Saturday evening was our farewell soiree. This is a brief video of the evening. Sorry about the poor sound, but it's all I had that was appropriate. President Chua picked us up Sunday morning and took us to the airport. We were met in Singapore by Elder and Sister Kunz (office couple) who took us to their old apartment where we stayed Sunday and Monday nights before heading off to the airport early Tuesday morning (That's tomorrow morning for us.). We have a dinner appointment this evening with President and Sister Simmons. The next installment of this blog will be written from our home in Ivins. It's really hard to believe that we're on our way. I will spend the time between now and then composing my thoughts for the final chapter. It will be written in about two weeks from now. God bless you all! Curse of the tears! We love you! Thank you for your examples! Can't wait to give you a big squeeze! I think I need it!